An assessment of the health system in the Republic of Moldova on 21–24 May 2013 produced recommendations to improve the control and prevention of noncomunicable diseases (NCDs) in the country. 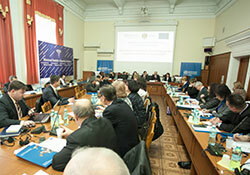 The findings and policy recommendations of the country assessment ("Health system barriers and innovations for better NCD Outcomes") were discussed and validated at a policy dialogue meeting held 19-20 February 2014 in Chisinau. The assessment in the Republic of Moldova was part of a WHO/Europe-led project, which also includes assessments in Hungary, Kyrgyzstan, Tajikistan and Turkey. The studies were carried out by multidisciplinary teams using a common approach and structured guide, tailored to the specific needs of each country. The guide itself was based on a background paper exploring the role of health systems in tackling NCDs. to provide a platform for a comprehensive NCD action plan. As part of the regional project, the assessments also contribute to the sharing of knowledge and experiences among countries of the European Region on common health system barriers to NCD control and appropriate approaches to overcome them. The assessment in the Republic of Moldova was conducted by a team consisting of international experts from WHO/Europe, the WHO Country Office, London School of Economics and Political Science, the United States Agency for International Development Central Asian Quality Project, and national experts from the National Health Insurance Fund, the National Centre of Public Health, the Center of Health Policies and Studies. and the State Medical and Pharmaceutical University. The study was led by the Ministry of Health Department of Policies Analysis, Monitoring and Evaluation. At the policy dialogue meeting in February 2014, key specialists and national stakeholders reviewed the data presented in the country report, identified successes and challenges, and built consensus around some of the key recommendations directed toward individual and public health services. increasing resources for public health services and risk factor reduction. improving rational prescribing practice through better drug lists and guidelines for prescribing. The report also addressed cross-cutting issues, such as strengthening undergraduate, postgraduate and continuing education curricula for the public health and primary health care workforce, including mid-level providers (feldshers and nurses). The "Report on assessment of the Health System Barriers and Innovations for Better NCD Outcomes" will serve as an evidence-based platform to empower national stakeholders, specialists and civil society to influence and compliment the national NCD control policies and programmes. The assessment results will also be used at national and international levels to share country experience on NCD control. The national assessment was organized as part of the biennial collaborative agreement (BCA) 2012–2015 between the Ministry of Health of the Republic of Moldova and WHO/Europe. This project is lined to a technical assistance project on health sector budget support funded by the European Union and coordinated by WHO, and a European Union/WHO joint initiative to support policy dialogue and universal health coverage.